Cats have been associated with humans for at least 9,500 years, and are currently the most popular pet in the world. Cat owners know both how sweet and how mean they can be, but the cat world is more than squealing over kittens. Genetics and selective breeding have created some distinctive and unique cats, and here are what the list author believes to be the 10 strangest cat breeds. The Devon Rex breed of cat has only been around since the 1960’s. They have been genetically proven not to be related to the Cornish or German Rex breeds. The strange thing about the Devon Rex is the fact that they have very little “guard hair”, the stiff, coarse, waterproof hairs present on most furred mammals. They have mostly “down hair”, or soft, fine undercoat fur. 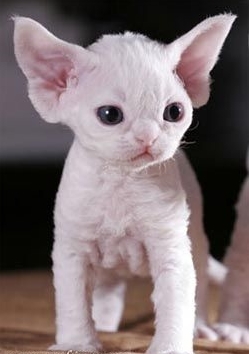 The Devon Rex is especially unique in that their down hair is curly. They also have rather large eyes, and large, low-set ears. Devon Rex cats are active, playful, and friendly, and enjoy being perched on peoples’ shoulders, like parrots. They are also very intelligent, and can be taught tricks, such as fetching and walking on a leash.